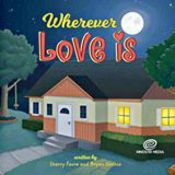 Here's a great price break on a my fantastic new bedtime book, "Wherever Love Is." 5 books for $47.99 (price includes shipping, handling, and sales tax). This deal also includes a free copy of my new Christmas instrumental CD, "December Recollections!" Please email me through this website if you'd like the books autographed or dedicated to anyone in particular. Also, if you'd like to purchase CDs along with these books, please contact me via email or call at 608-577-8716 to explore quantity discounts and options. Christmas Special Deal # 3: Any 5 CDs for $47.99!